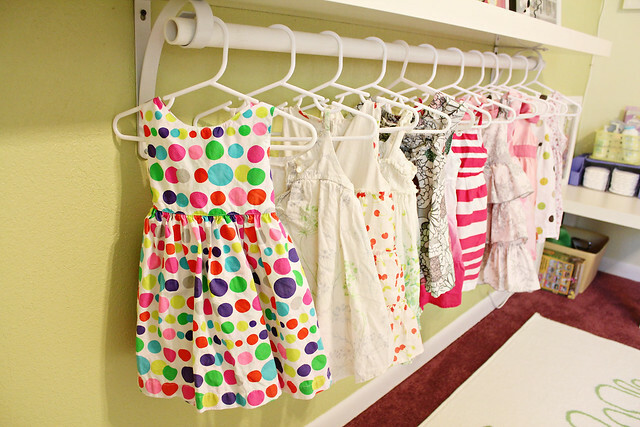 Baby clothes are so adorable, why hide them away in a dresser. I love displaying all her cute dresses and she does not tug them at all! Kaylee's newborn photos are done by the talented DCPG photography and Design! 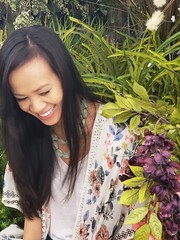 Having a professional photographer is so important because they can capture all the sweet moments for you to cherish forever. You can see more here and check our their website. Leftover pompoms from Kaylee's baby shower and 1st birthday Party. 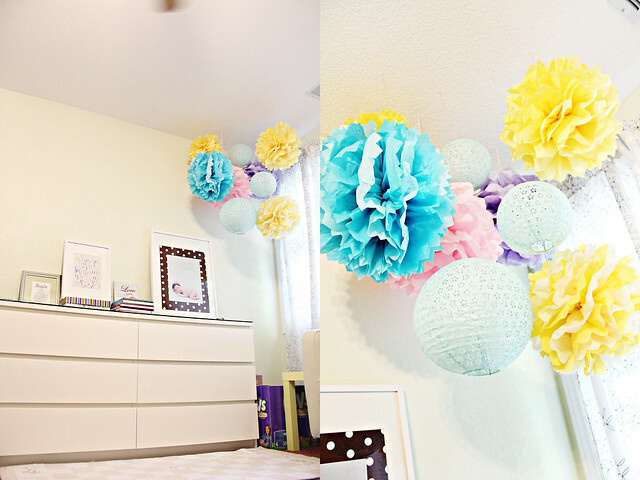 They are too adorable to throw away, make the room look so colorful and lively. This spot look familiar? This is where we take her monthly photos! You can see the old reveal here! 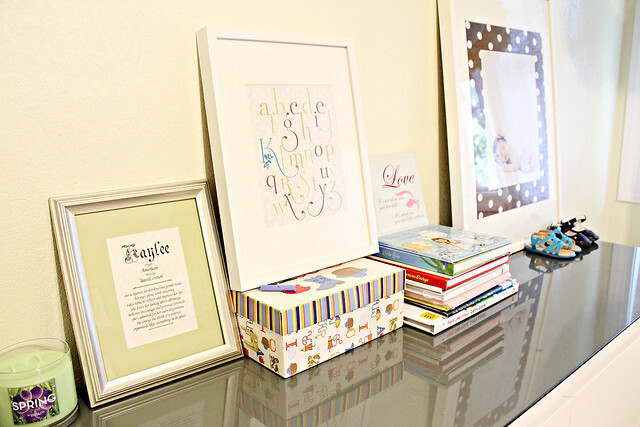 Don't forget to enter my Shabby Apple giveaway! so pretty and clean and organized!!! i need to frame some photos of baby boy as well. love the personal touches. This is the prettiest, neatest, most colorful room! You did a great job with all the artwork, framing/canvas, and little touches here and there. Love the poms poms in the corner! Her clothes are super super cute! I'm sure you have a closet full of them too, right? Hehe! WOW! 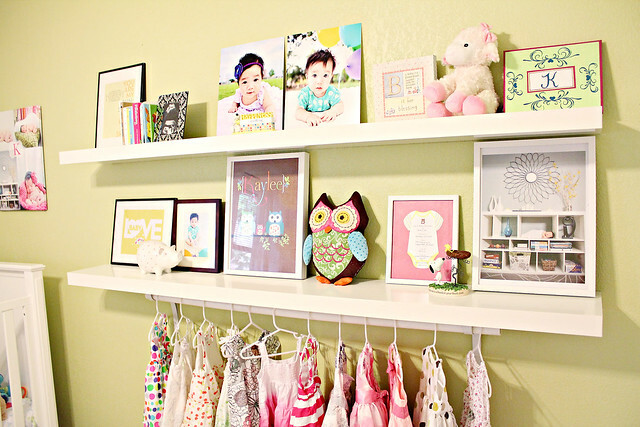 This is the cutest little girl's nursery I've ever seen! It's so pretty and so sweet. I love all the little details you included, so precious! 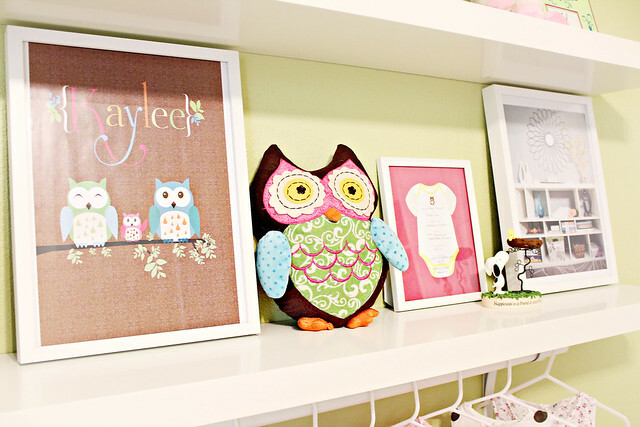 Kaylee has the most adorable room i must say. Every little detail reflects your attention to detail and love in decorating. I plan to buy a new bedroom set for a liitle one at the end of this year, she pretty much has outgrown her bed/crib. We wilk have to upgrade to a big girl set. So clean and crisp! Beautiful. Id love to shift there and stay i Kaylee's room! Its gorgeous! Lovely!! Great choice of colors! What color did you use on the walls? I love that you display her dresses! What an adorable idea! I'll have to do that some day when I have a kid. 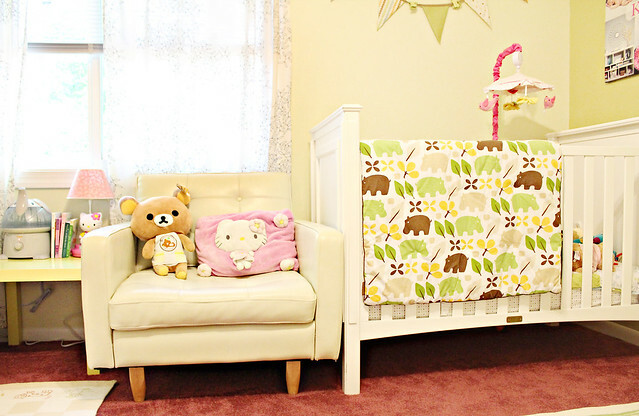 You did an amazing job with Kaylee's nursery. It's bright and cheerful. I love all the personal touch you added to the room. It's a beautiful room for her to grow up. 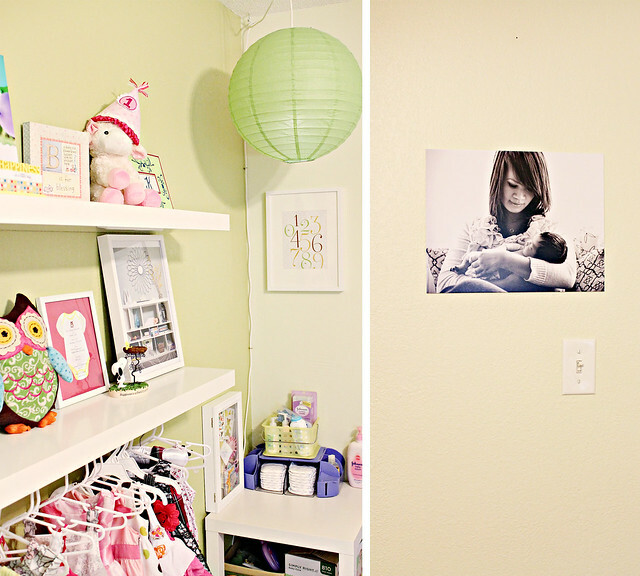 I have been meaning to post pictures of Ava's nursery forever. I just love looking at these! 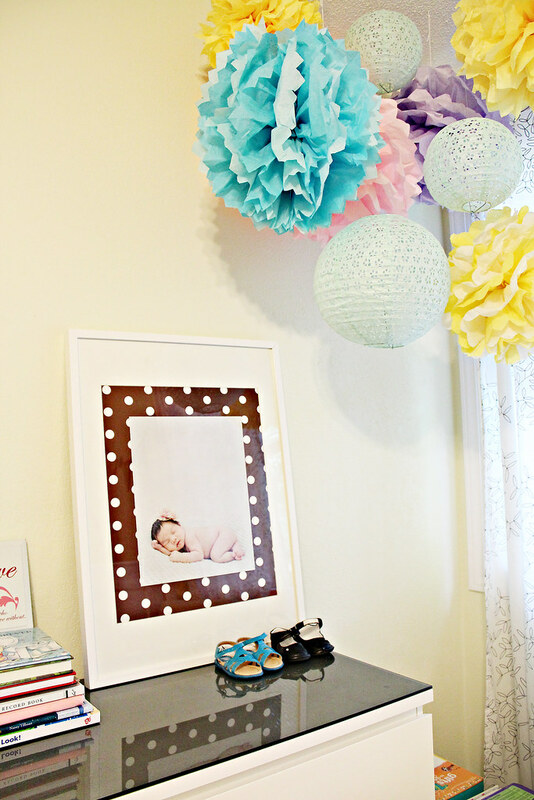 Kaylee's room is so serene and adorable too. Love the dress idea! Brilliant and adds so much to the space. 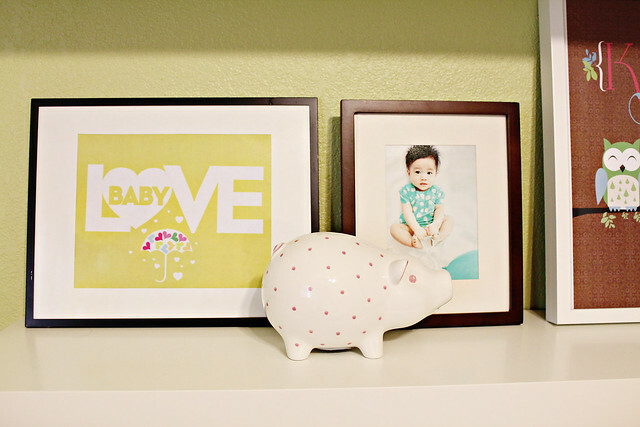 I love your nursery. So modern, girly, and clean... I love the photos you put up. WOW amazing this must have taken a long time...looks straight out of a magazine! I am inspired! So beautiful, you are talented. She has the most adorable set of dresses! it's absolutely incredible Yvonne! this belongs on the cover of a magazine with it's own spread. tremendous job, you have such a knack with design, color placement and creating clean looks....never cluttered, never too much of something. i get super inspired by what i always see here. 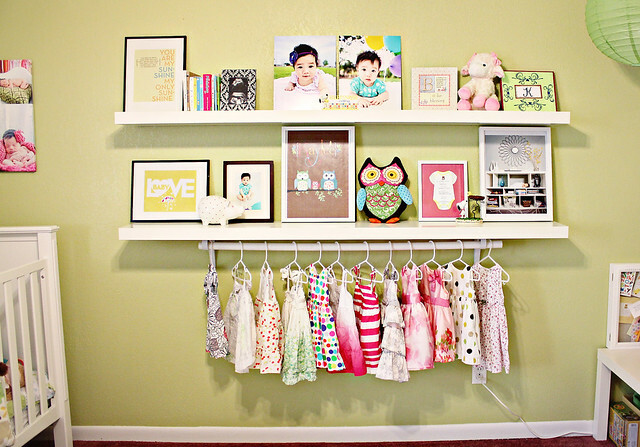 I LOVE her nursery! It's so amazing. 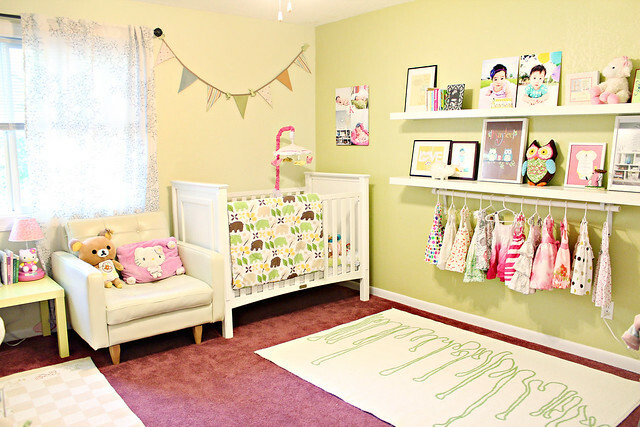 Can you please come over and decorate our nursery for us?? I agree with the importance of using professional photographer in capturing great moments that you can treasure even forever. Very effective! 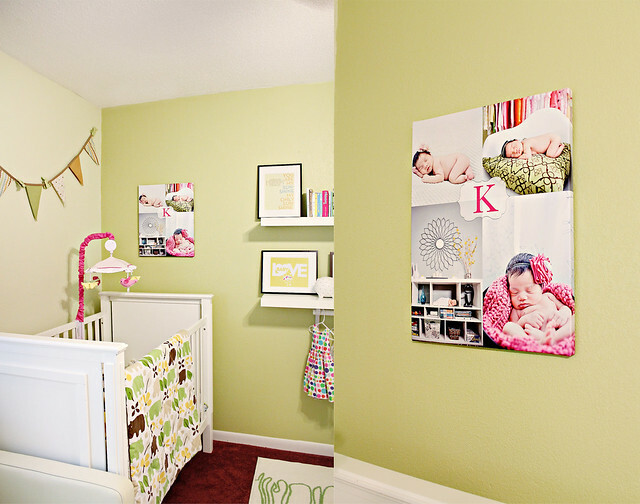 I really like the way how you designed your daughter's room. Very neat and pleasing to the eyes. This is SO beautiful! You did a fantastic job. It looks like one of those HGTV rooms by professional decorators!